Somewhere in the cross section of design, food, and fashion (yes, picture the ven diagram here) ~ you will find APRONS… and they are getting sexier, more playful, and far too cute to wear only in the kitchen now. 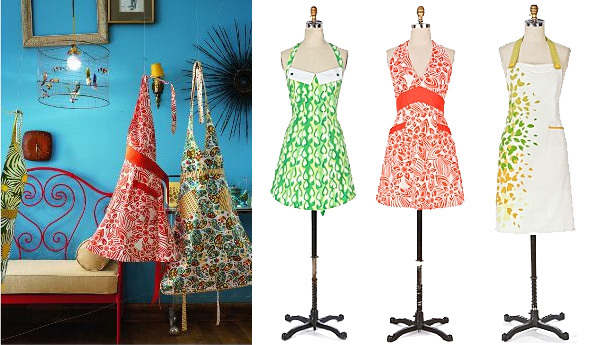 I’ve shown you the adorable aprons of Jessie Steele before, but check out the latest selection from Anthropologie. So with all the deliciousness to learn to cook on Tastespotting, i think its time i invest in one (or two, or a few?) cooking outfits! I saw a girl this past (very warm) weekend in San Francisco wearing a similar-styled apron as a top - it was really cute! I think I’ll end up making one for myself. BTW, this is one of my favorite sites - thanks for all the inspiration! These are fabulous! What a delightful gift this will make for my friend’s housewarming party. I might just have to pick one up for me too. What a beautiful site; I’m so glad I found you.